When she was 18, Arielle would come home every day and embark on what she calls an “Easter egg hunt." She wasn’t looking for candy. Arielle was hunting behind stairwells and inside closets in her suburban Long Island home for the OxyContin bottles her cousin brought home from work at a pharmacy and was hiding from her mother around the house. It took about a year before Arielle moved from prescription painkillers into the illegal drug that killed her best friend: heroin. She snorted it for the first time after tagging along with a friend who was going to buy some. "I was like, 'I love it,'" she said. Heroin was cheaper than prescription pills -- about $10 a bag, compared to $60 to $80 per pill -- and gave her a more potent high. Arielle landed in a Long Island jail last year after she was caught breaking into a house and stealing money to buy drugs. Now 26 and living at a substance abuse treatment center, she says she's all too aware that her story isn’t unique. Between 1996 and 2011, the number of people who ended up in substance abuse treatment centers in Suffolk County, where Arielle lives, as a result of heroin jumped 425 percent, according to a 2012 special grand jury report from the county’s Supreme Court. During the same period, the number of people who landed in substance abuse treatment for opioid pill use spiked 1,136 percent, the report found. Long Island is one of many areas of the country where heroin addiction is reaching harrowing levels, according to Gregory Bunt, the medical director at Daytop Village, a New York-based substance abuse treatment center. The crisis is getting renewed attention after actor Phillip Seymour Hoffman died last month from an apparent heroin overdose. The rise in heroin use mirrors a decade-long spike in abuse of prescription opioids -- painkillers that are a medical cousin to heroin, but are legal as long as they’re prescribed by a doctor. The result: Nearly four out of five people who recently started using heroin used prescription painkillers first, according to a 2013 study from the Center for Behavioral Health Statistics and Quality. “A lot of people who got in trouble with the prescription opiates are switching over to heroin, and they get more for their buck, so to speak,” Bunt said. In his experience, he added, much of the heroin available today is laced with other additives, like additional painkillers -- making it more dangerous. “Once you inject the heroin that’s available today, you’re at very high risk for fatal overdose,” he said. For decades, opioid painkillers, like oxycodone, hydrocodone and morphine, had been used successfully to treat conditions like intense pain at the end of life for cancer patients and acute pain after an injury like a broken bone. But everything changed when OxyContin -- and the marketing campaign that came with it -- started in the 1990s, experts say. The drug, developed by Purdue Pharma, had a time-release mechanism that spaced out its effects over a longer period of time. In dozens of seminars in ritzy hotel conference rooms across North America, the company sold doctors on the idea that the time-release function made OxyContin perfect for a population of patients who were suffering from chronic pain. Representatives also argued that the drug's spaced-out effects made it less likely that patients would get addicted -- which was the main factor deterring many physicians from prescribing opioids for chronic pain. “This campaign focused on convincing doctors that they shouldn’t worry about addiction, so the medical community was taught to believe that addiction to opiates was relatively rare,” said Andrew Kolodny, the director of Physicians for Responsible Opioid Prescribing. The pitch was convincing, Kolodny said, because no doctor wants to believe that they’re keeping a patient in pain unnecessarily. 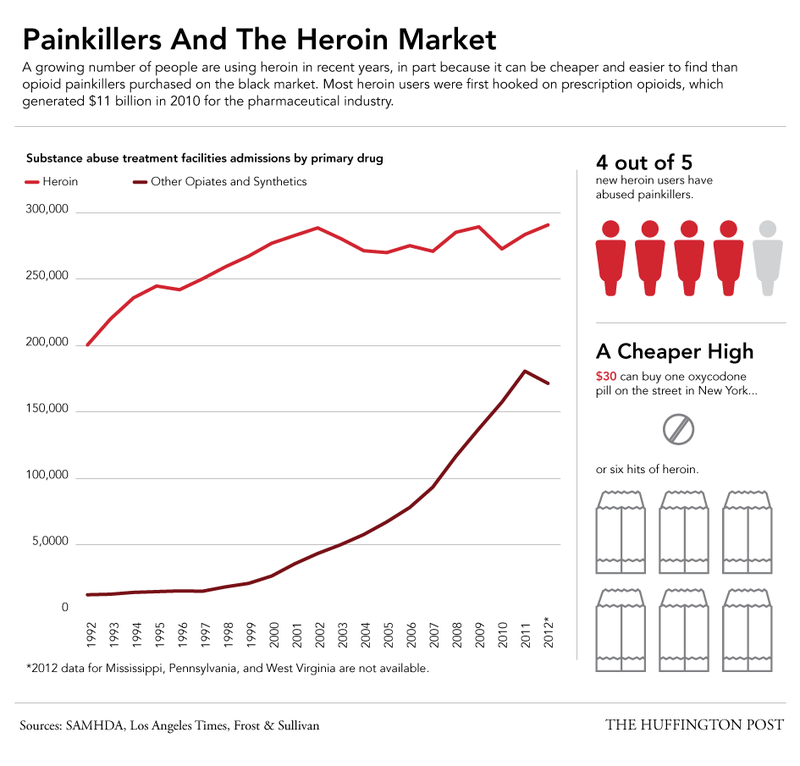 By 2001, OxyContin had exceeded more than $1 billion in sales, and by 2003, nearly half of the doctors prescribing OxyContin were primary care physicians, according to a 2004 report from the Government Accountability Office. “We have now this incredibly unusual public health crisis that’s essentially caused by physicians, caused by the health care industry,” said Meldon Kahan, the medical director of substance use services at the Women’s College Hospital in Toronto. Chart via the Harvard Kennedy School. In 2007, Purdue and three of its top executives pleaded guilty to misleading doctors, regulators and patients about OxyContin’s risk of addiction. The company agreed to pay more than $600 million in fines. In 2010, Purdue developed a version of the drug that was harder to crush and snort or inject than the original, aimed at deterring abuse. In April, the FDA banned the original OxyContin and all of its generic versions from hitting the market. Purdue Spokesman Raul Damas wrote in an email statement to The Huffington Post that “like any public health issue, opioid abuse is the result of many factors, not just one drug or one company.” Brand-name OxyContin represents a small share of oxycodone-based drugs on the market, and Purdue has taken steps to curb the addiction epidemic, like paying for addiction hotlines and working with law enforcement to help them better identify pills that are frequently abused. By the end of 11 months, Tully was on 280 milligrams of OxyContin per day. The mother of two, who had held down jobs since she was 12 years old, refused to leave the house for fear she’d miss a dose and go through terrible symptoms of withdrawal like nausea and profuse sweating. When she decided to get clean, it took her six years to completely get off the drug, and she says she’s lucky she was able to finally kick the habit. Indeed, according to Kolodny, "middle-aged women getting pain pills from doctors" are dying from overdoses at some of the highest rates in history. In 2010, 40 percent of U.S. drug overdose deaths were women, many of whom died from abusing prescription pills. 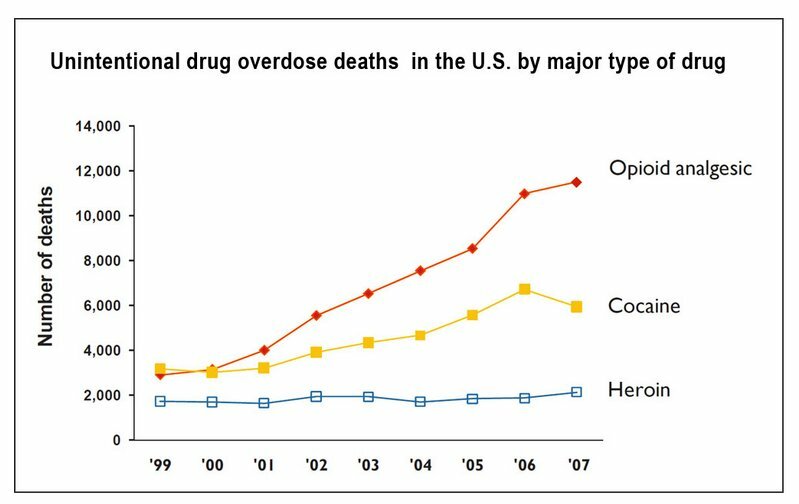 CORRECTION: Language was changed to clarify that while 40 percent of drug overdoses in 2010 were women, not all of them died from taking prescription pills.